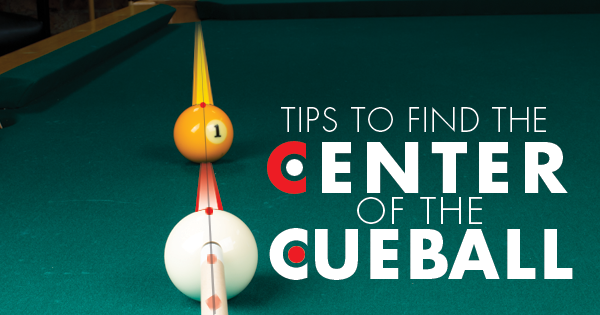 Finding the center of the cue ball isn’t as easy as it sounds. In fact, many players struggle with this due to a slight misalignment of the head over the pool cue; a flaw in the player’s fundamentals called the Vertical Axis Perception Error. Further complicating this seemingly simple task is the fact that the vertical center of the cue ball is different for every shot depending on where you ultimately want it to go. In order to get your ball to roll straight down the path you want, you must find and hit the vertical center of the cue ball for that shot line. 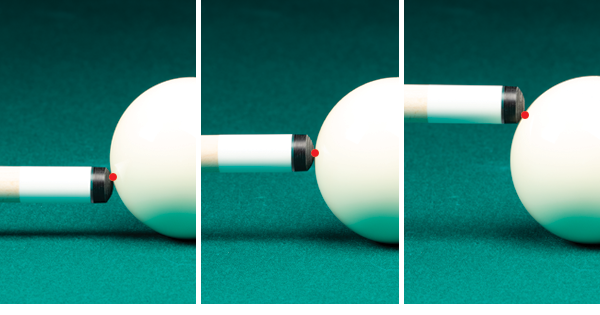 In this article, PBIA Master Instructor and founder of the National Billiard Academy, Tom Simpson, provides some tricks to help you identify the center of the cue ball and shoot straighter! Ask the Master: "Do you have any tips or advice for finding the center of the cue ball?" Assuming you don't have this perception issue, let's talk about "center ball." I see three centers: Vertical Center, Dead Center, and Center of Percussion. Hitting on the vertical center line is the only way to make the cue ball roll straight. Dead center represents the intersection of the vertical and horizontal axis. Hitting below this point will cause back spin or a skidding cue ball, while the center of percussion will provide a true roll at contact. The Vertical Center is the center line down the back of the cue ball. Dead Center and Center of Percussion are on this line. If you hit anywhere on the Vertical Center line, the cue ball goes where your stick is pointed. Hit either side of that line and the ball is no longer going straight down the stick line. How high or low you strike the ball on this line determines whether it begins moving with roll, skid, or backspin. Dead Center is the center both vertical and horizontal. You could imagine cross-hairs on the ball. 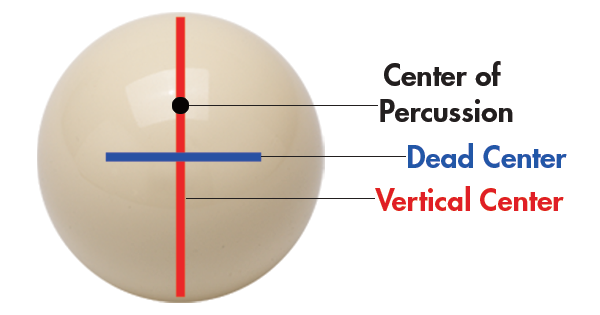 The Center of Percussion is a spot on the vertical center line where rolling distance is most consistent, since the cue ball begins its travel with full natural roll (no skidding or over spin). For practical purposes, this spot is about 1/2" above Dead Center. Here, you'll see that as you move your tip up or down from dead center, you're no longer hitting with the center of your tip. As a result, you might not be hitting as low or as high as you think. Realize that if your stick is flat and you hit Dead Center, you hit the center of your tip. As you hit higher, you hit the bottom of your tip. As you hit lower, you hit the top of your tip. Because our head is above the stick, there's a bit of an optical illusion. We think with the center of our tip, but often hit with the edge. We may not be hitting as high or as low as it appears. Check your chalk mark on the cue ball. (The Aramith Jim Rempe Training Ball is designed for this). The Vertical Axis of the cue ball is what touches the table, so I suggest placing your tip on the cloth at the base of the ball to find center, and then come up some. If you're trying to find the center on the upper half of the ball, match the curvature of the top of the ball with the top of your tip, and then come down some. 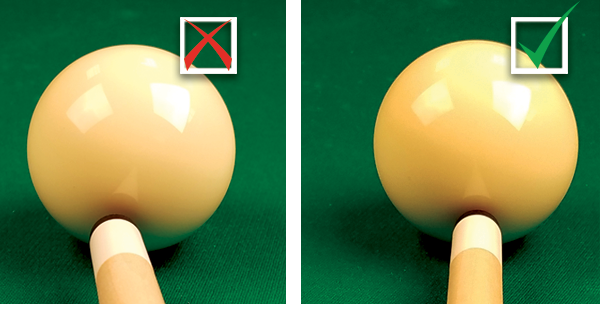 If the cue ball is shiny, look at the reflection of your tip and ferrule in the cue ball. If the reflection is curved, you're off center. The left picture is a dramatic representation of a "curved" reflection. You can clearly see from the reflection that the cue is not along the vertical center line of the cue ball. On the right, the cue reflection is not curved and you can count on the shot to go straight down the path you're aiming for.